This past week, when speaking to doctors about healthcare reform and the steps needed to reduce healthcare spending, the President answered a rhetorical question recently posed here about comparative effective research. JFS readers may find his answers interesting. His speech, however, didn’t receive widespread mainstream media coverage, at least in a form we would recognize. Before we look at what he said, it might be helpful to sort through some popular misconceptions about what comparative effectiveness research is and isn’t. The American Recovery and Reinvestment Act (known as the stimulus package) expanded the Agency for Healthcare Research and Quality and increased its funding with $700 million for comparative clinical effectiveness research, with an additional $400 million to be allocated at the discretion of the Secretary of HHS. 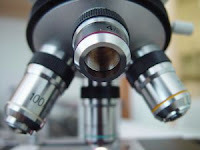 A new Federal Coordinating Council for Comparative Clinical Effectiveness Research was created to compare the merits of various competing medical treatments and strategies and make its recommendations to the Congress and Secretary of Health and Human Services about what medical interventions are effective, cost-effective and appropriate for the prevention, diagnosis and treatment of diseases and other health conditions. That objective might sound rather benign: as if experts will be making sure our tax dollars are prioritized so they’ll go towards advancing health interventions that offer us the best quality of care. But, that is not what it’s saying. Follow along as we re-read what the text on pages 806-26 of the Stimulus Bill really says. The $1.1 billion funding will first encourage the adoption and use of electronic health registries and databases that the government can use to generate outcome data — in other words, to compile observational correlations, not to conduct randomized, controlled intervention trials that are the gold standards of evidence-based medicine. Note that electronic medical records are also included as a way to disseminate the government’s comparative effective research — that’s referring to those electronic prompts that tell healthcare professionals what tests, drugs and treatments they should order and records their performance. The text of the stimulus bill goes on to specifically say that the funds must consider input from stakeholders and ensure the optimum coordination with research that’s supported or conducted by Federal agencies and departments. The Federal Coordinating Council will then consider this to make its final recommendations to the HHS Secretary and President. Yet, the members of the Council are all to be political appointees from senior management of each of those federal agencies responsible for the government’s health programs, appointed by the President and who work under the HHS Secretary. Now, in reality, how likely will political appointees of Federal agencies, with huge programs and budgets under their control, and who are answerable to the President and HHS Secretary, be to recommend their programs be defunded or to go against the healthcare reforms outlined by the President and HHS Secretary? The ramifications are clear to medical professionals, even if they may not be to the public. The availability of health interventions that aren’t determined to be optimum, effective or consistent with national priorities will die from lack of funding. We might want to believe that this plan won’t interfere with the care that our individual doctors provide and that is will merely offer “information and guidance about best practices.” But doctors, who’ve had years of experience with Pay-for-Performance measures know the reality of third-party payer clinical guidelines. They are concerned that their clinical judgment and knowledge about what care might be best for their individual patients, as well as consistent with the wishes of their patients, will be replaced by the determinations of a government agency. These aren’t clinical guidelines and recommendations for medical practitioners in their care of patients — instead, like other pay-for-performance measures, they will have the force of regulation and power of law in compelling compliance. Any healthcare professional whose practice fails to comply with what the government determines is effective, quality care will find himself uncompensated, as well as demoted as a “quality provider” and vulnerable to malpractice lawsuits. Doctors won’t, can’t, risk providing care outside the line — and insurers won’t cover care that isn’t government-approved — out of fear of liability or financial demise. Understandably, medical researchers also won’t want to pursue costly research on innovative and potentially life-saving drugs, treatments and medical devices that aren’t in line with government supported programs. The dangers are evident: when government is given a greater role in determining what research is funded and what findings are endorsed and adopted, riskier research or research for rarer conditions or less politically popular issues could be jeopardized — and medical advancements could be held back. Today, there are 153 P4P (“quality”) measures that Medicare lists as necessary, based on comparative effectiveness research. Doctors who don’t comply with these P4P measures, and who fail to use electronic medical records integrated with government databases, see their reimbursements cuts, receive bad quality ratings and find their patient referrals slashed. That is most certainly governmental supervision and control over the practice of medicine and the manner in which medical services are provided, isn’t it? Pay-for-performance measures are certainly governmental supervision or control over compensation of a person providing health services, isn’t it? The undeniable fact is that whoever pays calls the shots over the care we receive — not our doctors and not us. Medicare recipients had also originally been assured that this program was voluntary and merely a safety net to cover major medical expenses for poor seniors and Congress had promised that the program (Section 1803) would not interfere with people’s ability to purchase private health insurance. Today, every senior who wants to receive the social security benefits they’ve paid into their entire working lives, is automatically enrolled into Medicare Part A. The only way to opt out of the government managed healthcare program and its mandatory government oversight is to sign away their monthly social security benefits. Did you know that? More importantly, think about what is really being discussed here: putting the government in charge of deciding where limited healthcare dollars and resources will go; what therapies are appropriate for the government to pay for and not; and who gets life-saving drugs and medical care, and who should go without — this is inevitably making life-and-death decisions about how medical care should be rationed. This effectiveness research model is similar to other programs used to establish government healthcare spending. In Britain, for example, the National Health Service uses the National Institute for Clinical Excellence (NICE) to determine which treatments it will offer. We would all like to believe that health care available to people would be free from influence by special interests or profit, and based on the soundest medical evidence. But as we’ve seen with the NICE guidelines, that isn’t what happens. Lots of things are supported and authorized by government committees that have failed to demonstrate that they improve health or clinical outcomes, reduce mortality, or reduce healthcare costs or hospitalizations; things that are even potentially harmful for significant numbers of people. We’d also like to believe that human compassion and medical ethics would prohibit medical professionals from having to deny care to individual patients who are seen by the government as undeserving or not worth saving, or be forced to act in ways that may not be in the best interests of their individual patients. But last year when NICE released its Social Value Judgments, outlining its guiding principles for allocating National Health Services resources, the realities of the value of life versus the interests of the state and stakeholders were brought home. Will you be denied knee replacement for a shattered knee because you are fat and “noncompliant” with the government’s weight loss advice? Will your grandmother, who could live another 20 active years, be denied a heart operation because she’s too old per government guidelines? Will a Down’s child be seen as a life not worth saving when he needs a life-saving surgery? Will you be denied medical care if you refuse to take statins, enroll in a weight loss program or get a mammogram the government says you must do? It feels far more reassuring to believe that the government or a third-party payer will make the wisest, most evidence-based decisions about what health care is best for us and will take care of us, that we’ll all have access to the care we want, and that rationing will never happen. But that is not reality. There isn’t enough healthcare monies and resources. Cost-effectiveness analysis means looking at the most effective ways to divide a pot of money. It does not mean the inventions save healthcare costs, as is popularly believed, explained professor Louise B. Russell, Ph.D., at the Institute for Health, Health Care Policy and Aging Research at Rutgers University. Cost effective research means budgeting and making decisions about where to cut costs. But will those very difficult decisions be made objectively, based on the best evidence, and grounded by medical ethics, or will they be politicized and money disproportionately going towards things with the most powerful lobbies and popular causes? We don’t have to look at Britain to see how government comparative effective research will play out here and how politicians and government agencies prioritize healthcare spending. We already have an example right here at home. The Oregon Legislature began the first and only project in our country to develop a policy for setting health care priorities for the state’s health plan. 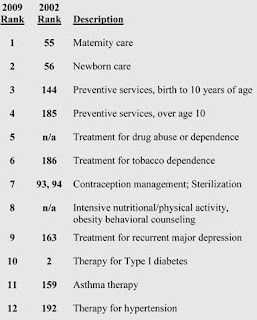 In 1989, it created the Health Services Commission to develop a prioritized list of health services ranked in order of importance to the entire population to be covered. The unpopular results were adjusted based on their relative importance as gauged by public input and the Commission’s judgment and individual condition/treatment criteria were prioritized according to their impact on health, comparative effectiveness, and (as a tie-breaker) cost. Confusing health coverage with health care, and confusing quality with better health outcomes for people, misleads consumers every time. The first prioritized list of health services was released in 1993 and has been updated every two years, as part of the State’s budget process. The priority list for 2010-2011 is nearly identical to those currently in effect. Reading through the priority lists, you see a dramatic change in the conditions’ rankings over this decade. 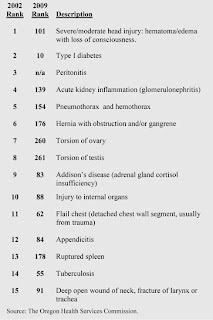 Life-saving medical care that used to be ranked high in 2000-2002 — such as head trauma, type 1 diabetes, peritonitis, acute kidney infection, pneumothorax and hemothorax, hernia and/or gangrene, etc. — has been shifted down. Meanwhile, interventions with poorer evidence for effectiveness or for reducing healthcare costs rank near the top, such as preventive services, substance abuse and smoking treatment, contraceptives and sterilization, obesity, and depression. Interventions the government now prioritizes for funding and policy support are those of popular political causes and heavily lobbied financial interests, not those that are the most evidence-based. For example, obesity treatment (including nutritional and lifestyle coaching) had been ranked at #645 in 2002. Today, obesity treatment ranks 8th. Chronic diseases of aging and conditions that most affect older and disabled people, such as chronic obstructive pulmonary disease (now ranking #305), cataracts (now #320), cirrhosis of liver (now #332), life threatening cardiac arrhythmias (now #303), knee surgeries (#448 and #618) and cancers have all been shifted significantly lower on the list. [It feels more palatable when people believe that diseases are victims' own fault and the result of failing to adopt healthy lifestyles. See how easily discrimination and eugenics can come to feel acceptable to a populace, especially when it rejects science?] Treating high cholesterol is ranked higher than appendicitis with abscess; intoxication is ranked higher than acute bacterial meningitis; dental cleanings is ranked more important than treating diabetic retinopathy, strokes or heart failure; treating attention deficit (ADHD) is ranked more important than treating cervical cancer, malaria or a ruptured spleen; and sleep apnea is higher than treating Parkinson’s Disease or a ruptured aortic aneurysm. And preventive wellness, smoking cessation and treating obesity is prioritized above all of these medical conditions — familiar stakeholder agendas, but offer little medical care when you need it, nor do they reduce medical costs. Comparative effectiveness analysis means that the return on investment will always be lower among older people. Comparative effectiveness analysis is not the same as evidence-based medical care, or that it’s been shown to be effective for improving the lives of people and reducing their risks of dying. Comparative effectiveness analysis is not about reducing medical costs. Or, is this not really about science and helping people, but about advancing ideologies and profiting stakeholders? Is the new Federal Coordinating Council for Comparative Clinical Effectiveness Research more about finding support for the government’s national healthcare reform agenda? 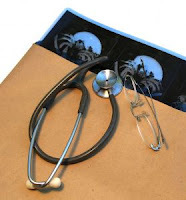 First, we need to upgrade our medical records by switching from a paper to an electronic system of record keeping. And we've already begun to do this with an investment we made as part of our Recovery Act…And that will not only mean less paper-pushing and lower administrative costs, saving taxpayers billions of dollars; it will also mean all of you physicians will have an easier time doing your jobs…It will prevent the wrong dosages from going to a patient. It will reduce medical errors, it's estimated, that lead to 100,000 lives lost unnecessarily in our hospitals every year. No one stood up to show the President the medical literature disproving these claims. No one stood up to show the President the medical literature disproving these claims. Not one doctor explained risk factors or spoke out against discriminating against people based on numbers that are poor measures of anything but age, hereditary and social class. Our federal government also has to step up its efforts to advance the cause of healthy living. Five of the costliest illnesses and conditions — cancer, cardiovascular disease, diabetes, lung disease, and strokes — can be prevented. No one stood up to show the President the science disproving these beliefs. With doctors paid more for treating healthier people with good numbers than older, sicker people with chronic diseases of aging, what do you think is going to happen? So one thing we need to do is to figure out what works, and encourage rapid implementation of what works into your practices. That's why we're making a major investment in research to identify the best treatments for a variety of ailments and conditions… So replicating best practices, incentivizing excellence, closing cost disparities — any legislation sent to my desk that does not these — does not achieve these goals in my mind does not earn the title of reform. So, will comparative effective research mean the government will shut down its own programs that have been found to be unsupported by the preponderance of sound evidence? Clearly not. Politicians are not scientists and economists are not medical professionals, yet do we want politicians and economists making healthcare decisions for us and deciding what’s best? Will enough Americans see what is happening and where they are leading us? In the face of this changing terrain, the IOM Roundtable on Evidence-Based Medicine has been convened to marshal senior national leadership from key sectors to explore a wholly different approach to the development and application of evidence for health care. Evidence-based medicine (EBM) emerged in the twentieth century as a methodology for improving care by emphasizing the integration of individual clinical expertise with the best available external evidence and serves as a necessary and valuable foundation for future progress. EBM has resulted in many advances in health care by highlighting the importance of a rigorous scientific base for practice and the important role of physician judgment in delivering individual patient care. However, the increased complexity of health care requires a deepened commitment by all stakeholders to develop a healthcare system engaged in producing the kinds of evidence needed at the point of care for the treatment of individual patients. To improve the specificity of treatment recommendations, Greenfield suggests that prevailing approaches to study design and data analysis in clinical research must change. The authors propose two major strategies to decrease the impact of HTE in clinical research: (1) the use of composite risk scores derived from multivariate models should be considered in both the design of a priori risk stratification groups and data analysis of clinical research studies; and (2) the full range of sources of HTE, many of which arise for members of the general population not eligible for trails, should be addressed by integrating the multiple existing phases of clinical research, both before and after an RCT.